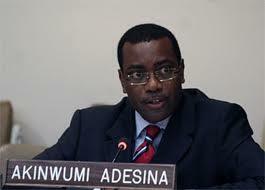 Dr Akinwumi Adesina: Building resilience in Nigeria – One Billion Hungry: Can We Feed the World? Also launched in 2012 was the Growth Enhancement Support (GES) through which farmers receive subsidised seeds and fertiliser via vouchers on their mobile phones. The government was taken out of the procurement and distribution of these inputs, ending corruption in the sector. In the first three months, 1.2 million farmers received subsidised inputs through their mobile phones and the target is to reach 5 million in 2013. The GES has incentivised seed and fertiliser companies to develop value chains to supply directly to the farmer and in 2012 fertiliser and seed companies sold $100 million worth of fertiliser and $10 million worth of seeds directly to farmers, as opposed to the government. Increasing accessibility to farm inputs, in the words of Dr Adesina, unleashed an agricultural revolution, and food production rose by 8.1 Mt in 2012. Along with increasing access to inputs, Nigeria is also expanding farmers’ access to financial services. To achieve this, the Central Bank of Nigeria has established a $350 million risk sharing facility (NIRSAL) to reduce the risk of lending by banks to farmers and agribusinesses. It has plans to reduce interest rates form 18% to 8% and in 2013, will share risks with banks to lend $ 400 million to the private sector seed and fertilizer companies and agrodealers. This will make agricultural inputs available to 5 million smallholder farmers across the country in 2013. In 2012 a major flood was predicted and there was panic about a looming food crisis. In order to ensure decisions were based on evidence, Dr Adesina, in partnership with the International Water Management Institute (IWMI) used satellite imagery and remote sensing to understand the extent of the flood. The result was that around 1.17% of the total cultivated land area was expected to suffer crop losses. Five months on from the flood there has not been a food crisis. A Flood Recovery Food Production plan was put in place that included provision of free early maturing seeds, fertilizers and farm implements to farmers affected by the floods; 40,000t of food from Nigeria’s strategic food reserve was released to flood affected families; and accelerated dry season cultivation of rice and maize was pursued. Building Nigeria’s capacity to predict and respond to risks based on clear evidence is a key priority to building the country’s resilience as a whole. Nigeria aims to encourage the cultivation of such crops as cassava and sorghum as well as develop the markets for these foods. A major effort to turn Nigeria into the largest processor of cassava and sorghum in the world was launched and they are using fiscal policies to encourage the production of cassava for high quality cassava flour, thus reducing some imports of wheat. Cassava bread, made from 20% cassava flour and 80% wheat flour is cheaper than 100% wheat flour bread and will boost the cassava farming industry. Nigeria have already secured contracts with China for the export of dried cassava chips and are pursuing relationships with other private sector actors to invest in the production of starch, sweeteners and sorbitol from cassava. Owing to the likelihood that climate change will bring a greater variability in rainfall and more frequent floods and droughts, water is a key factor in Nigeria’s resilience plans. Despite having 200 dams, only 150,000 hectares or less of cultivated land is irrigated in the country. The government is prioritising small-scale agricultural water management systems, which according to the IWMI, can employ 45 times more people and cover 35 times more land than large-scale public irrigation schemes. In-situ water harvesting can benefit 147 million people and generate $9 billion per year while communally managed river diversions can reach 113 million and generate $14 billion per year. Targeted policies to install these priorities will include subsidies for the ownership of motorized pumps especially by women farmers, financing the leasing of irrigation equipment, provision of community loans for the management of water sheds, establishing youth-led irrigation service providers who rent out motorized pumps, and provision of subsidies for alternative energy in rural areas to allow the powering of motorized pumps. To mitigate future risks, Nigeria also has plans to scale up weather index insurance schemes for farmers and to provide subsidies to address problems of affordability. Social safety net policies will include conditional cash transfers, school feeding programs and nutritional interventions. Nigeria’s “Saving one million lives” initiative, which aims to reduce undernutrition is already providing care for 200,000 severely malnourished children. In partnership with the International Potato Center (CIP), Nigeria is promoting orange flesh sweet potato (which is rich in beta carotene), with the goal of reaching 1 million households by 2015. A further consideration to add to these 6 priorities is price volatility. Expanding their strategic food reserves, developing a nation-wide agricultural commodity exchange and improving farm-level storage systems will go some way in stabilising food prices. Key to successful implementation of these plans and to managing agriculture in the face of shocks is the integration of policies, institutions, technologies, systems and tools for enhancing resilience. As Dr Adesina reinforced, the focus of policy makers and donors should therefore shift away from crisis management to risk management; combining early warning systems, disaster planning, management and recovery plans. It certainly seems like Nigeria are laying the foundations for a resilient food production system and we look forward to watching Nigeria’s progress, under the leadership of Dr Adesina.